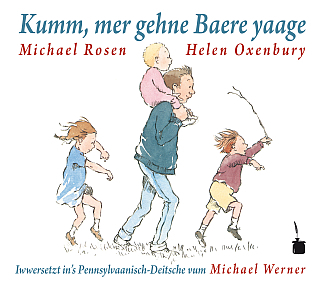 “Kumm, mer gehne Baere yaage” is a wonderful Pennsylvania Dutch translation of a delightful English children’s book titled “We’re going on a bear hunt.” The book is interactive with readers and listeners imitating the noises and gestures suggested by the story. A great book with many full color illustrations by Helen Oxenbury and lots of fun for children and adults alike. Kumm, mer gehne Baere yaage. Mer sinn ya gaar net bang.